Bram Stoker, the Irish-born theatre manager and author, was probably the first to find a historical, bloodthirsty figure entrenched in Transylvanian history and transfuse it into a bloody yarn of gothic eroticism. He applied some blood sucking attributes to the character and created the novel, Dracula. It has inspired more film and stage adaptations than any novel in the history of English literature. Transylvania (and Dracula) both conjure up all sorts of brooding and sinister overtones, but to paraphrase Dracula, quoting from Deuteronomy 12:33 – “If blood is life,” then Transylvania brims with both. The “land beyond the forest” (Latin translation for Transylvania), one of the wildest and least known parts of Europe, is actually an enigmatic realm in modern-day Romania. More than 500 years ago Vlad Tepes (1431-1476) was the ruling prince of Wallachia, a Romanian-speaking feudal principality, who lived, as Stoker asserted, “in the midst of the Carpathian mountains (where) every known superstition in the world is gathered … as if it were the centre of some sort of imaginative whirlpool”. Vlad’s father was Vlad Dracul. In Romanian genealogy, the son adopts his father’s moniker and adds an ‘a’. The result: Dracula. He ruled with an iron fist and sharp skewer, impaling his enemies on stakes, thus earning the nickname, Vlad the Impaler. Stoker’s Gothic yarn based on him has now been in print for more than a century. ‘Tis ever thus. Many regional trains today are often booked manually. Timetables are tenuous at best. A lot of rural locals choose horse and cart instead, although that might also have something to do with Western influence not quite reaching this neck of the woods. On the good side, there’s hardly a Pepsi sign in sight. Beyond the green swelling hills … rose mighty slopes of forest up to the lofty steeps of the Carpathian themselves. Right and left of us they towered … an endless perspective of jagged rock and pointed crags, where snowy peaks rose grandly. Surprisingly, Transylvania retains a distinctive medieval air. Towns like Brasov and Sibiu, with their wonderfully preserved civic squares, seem to have been transplanted straight out of 19th century Germany. The Saxons are to blame. Their 12th century establishment of Siebenburgen (seven forts) has left an enduring Germanic influence, which separates the region, aesthetically and culturally, from much of Romania. 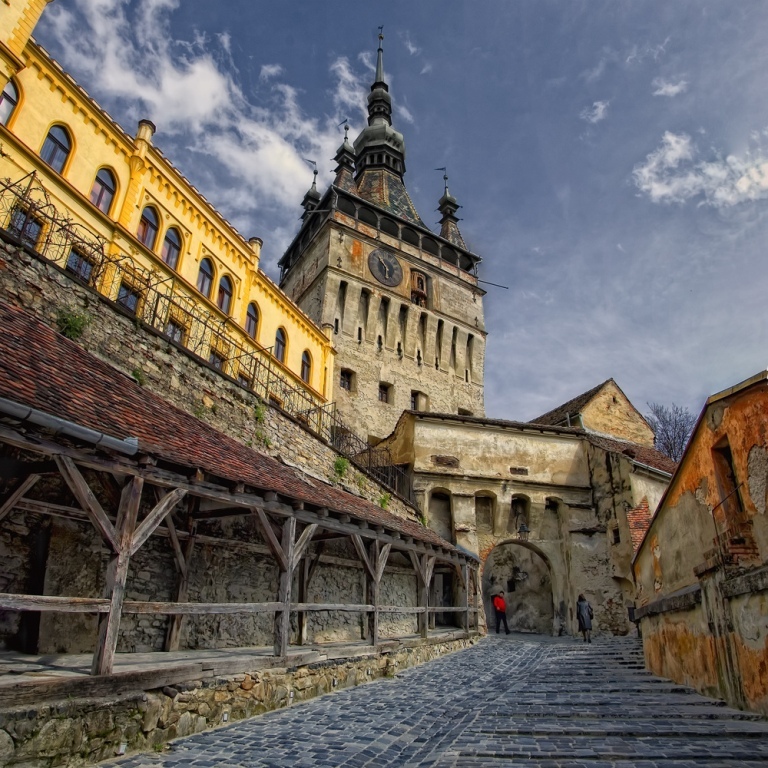 The jewel in this medieval crown is undoubtedly Sighisoara. Its imposing array of ramparts perched in the foothills of the Tirnava Mare Valley remind you, to quote Stoker again: “of a frontier that’s had a very stormy existence”. With spires reaching skyward seemingly everywhere, it’s entirely fitting that this should be the birthplace of Vlad the Impaler. Dracula is a hero here. The building where he was born is now a restaurant; house cocktail is the Bloody Mary! Impressive monasteries, museums and glorious views from the 14th century citadel remain refreshingly free from the ravages of marauding warlords and warring capitalists. But this is Transylvania. And still no sign of a castle. Drac-tracking tourists demand as much. The one with any sort of legitimate claim to Dracula’s occupation, to the north near Bistrita, lies in ruins, ransacked over centuries because, as Stoker notes; “a series of great fires took place, which made terrible havoc on five separate occasion”. If Dracula had any sort of architectural appreciation, he’d have arguably settled in Bran, a small town commanding the mountain pass of the same name. Perched on a rocky massif, what’s now billed as Dracula’s Castle was in fact a citadel built in 1377 to safeguard the southern gateway of trade and troop movements between Transylvania and Wallachia. It is a foreboding fortress, like something from a Tim Burton movie set with its tiers and needle-like towers. On closer inspection, whitewashed walls and modern utilities remind of the present while queues of coaches spewing souvenir-hungry hordes point to the future. Tourism could no doubt be the fiscal life cord for the region. With proper management, it may even be the country’s EU springboard. Economically, Romania remains one of the poorer cousins in the former Communist clan. Western currency goes a long way; budget comfort (ie lodgings, meals and public transport) can be had for as little as $25 a day. Politically, the country, like others in Eastern Europe, changed sides in 1989. But Romania’s revolution was not the velvet0cloaked affair enjoyed elsewhere. Nicolae Ceausescu, despot, megalomaniac and staunch defender of the State (but not before his own family and wealth), was summarily tried and executed by firing squad. His executioners were instructed not to shoot him in the face so it could be broadcast on television. Reality TV writ large a decade before Big Brother and Survivor savaged our senses. However, many of Ceausescu’s bureaucratic cronies swapped Communist hats for capitalist and remained in positions of power and relative affluence for some time, thus embedding a tainted and corrupt legacy on the struggling new administration as it attempts to align Romania with EU counterparts. It can be argued a similar ideological transfer happened during the French Revolution and Paris went on to become Europe’s most popular tourist destination; its present romanticism not entirely unrelated to its Bastille-storming past. Although Transylvania will probably never achieve such exalted status as France’s capital, it’s definitely worth escaping the crowds of Budapest and Prague for a ‘transfusion’ of fresh travel encounters in Dracula’s homeland.